On this day in dinosaurs, the most famous, or infamous, feud in all of paleontology went public. The New York Herald ran a headline that read “Scientists Wage Bitter Warfare,” and the private animosities and accusations of Edward Drinker Cope and Othniel Charles Marsh–the two giants of American vertebrate paleontology–became a tabloid delight. If you have more than a passing interest in dinosaurs, paleontology, or the history of science, the names of O. C. Marsh and E. D. Cope will be familiar to you. Many books have been written about their individual careers and their enormous contributions to science and our understanding of dinosaurs. However, in an ironic twist, they will always be thought of together. Their mutual enmity forged a unity in the collective imagination so that today, one is rarely mentioned without the other. O. C. Marsh and E. D. Cope. Courtesy of Wikimedia Commons. 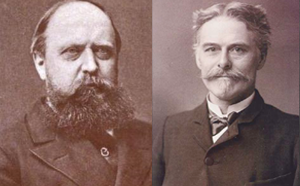 This clashing of science, popularly known as the “Bone Wars,” began in scientific journals where the two men were hasty to discredit each other’s work, and to name more species of prehistoric animals than their rival (Paleontologist Robert Bakker referred to some of their willy-nilly naming practices as ‘taxonomic carpet bombing’). The battles continued in the rich bone beds of the American West, where legendary encounters took place between opposing work parties. Bones were hidden, smashed, and even stolen from rival worksites. But the New York Herald headline was something more. Cope presented his ‘Marshiana’–a collection of notes and observations he had been keeping for years to bring Marsh down. He contended that Marsh had misused government funds through his work with the U.S. Geological Survey. Marsh fired back with his own accusations about Cope and the two clashed in print like bull Triceratops for weeks. The newspaper battle was perhaps the high point of their lifelong tussling, and it was the beginning of the end for both of them. The rivalry became so fierce that it consumed them–men who at one time had been friendly enough to name species after each other. This hatred would, in the end, rob both men of their fossil collections, their working positions, and in some ways, their sanity (Cope was said to be paranoid even on his death bed of Marsh finding his private notes). Their feud lasted beyond the grave. Cope left his body to science so that his brain could be measured. He was sure it could be scientifically proven that he was more intelligent than Marsh. But Marsh never reciprocated, and we know now that measuring brains is not an accurate measure of intellect. Though they may have been the worst of rivals, Marsh and Cope are responsible for many of the most famous specimens in the hallowed dinosaur halls of the East Coast natural history museums. They named most of the iconic dinosaurs from the Jurassic and many from the Cretaceous as well, and their collections are still used for research today. Although it became a tabloid travesty, the Cope and Marsh feud was one of the most fruitful rivalries in science and we dinophiles are indebted to them both. Share photos with your favorite Cope and Marsh dinosaurs on Facebook and Twitter using the hashtag #TDIDinos.